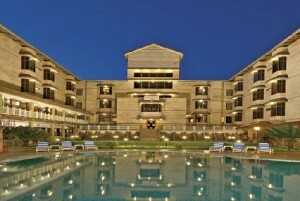 The Majestic Goa is a Deluxe Hotel with 5 Star facilities. 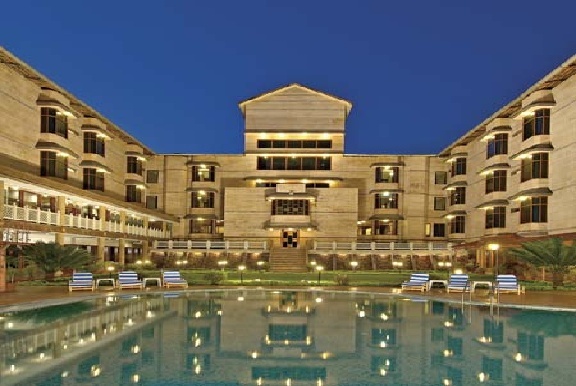 It is set atop a lush green hillock that is fronted by the River Mandovi Bridge Highway, one that connects the Capital to the north Goa Beaches. The Hotel presents a business guest or a holiday guest a choice of world-class leisure and business facilities, exquisite Goan & Indian Cuisine with the inimitable comforts of a home. It is just 4 minutes away from Panjim city , 10 minutes from Miramar beach and 20 minutes away from Calangute / Baga beach. The Majestic hotel rooms are all air conditioned with ceiling fans, television, mini bar, telephone with direct dial, newspapers and hair dryers. The bathrooms have hot and cold water showers with bathtubs. There is special beauty saloon with spa where ayurvedic message is available. This is accompanied with the health club and gym of its own. The majestic offers several dining options such as the Zayka which serves multi cuisine, the Mandovi is the coffee shop, the bar is called Gagar and Angethi is the barbeque. The Majestic offers a travel desk, money changer, laundry facilities and safe deposit boxes. It also has conference facilities and meeting rooms, the indoor recreational facilities and indoor games helps for relaxation and recreation. There is also a disc and dance floor for the entertainment of the visitors. There is a free shuttle service to the Panjim city as well. The Majestic offers services like Swimming Pool, Health Club with Ayurvedic Massage Center, Gymnasium, Beauty Palour/ Saloon, Shop, Laundry, Room Service, Doctor on Call, Travel Assistance, Foreign Exchange Service, and Safe Deposit Lockers. Twin / Double Room Accommodation in Deluxe and Superior rooms and Two room lounge accommodation in suites. Centrally Air Conditioned room with CC.TV and “Electrolux” refrigerator and tea / coffee makers. If you have not decided yet or wants to customize tour itinerary or hotels listed above in "4 Star Majestic Hotel Package in Goa", then we can change the travel itinerary and make a personalized, tailor-made holiday package, especially for you. We can modify this travel package as per your itinerary, budget, duration and the tourist places you would like to visit, including transportation and airfare should be included or not. Please fill the form below to contact us.